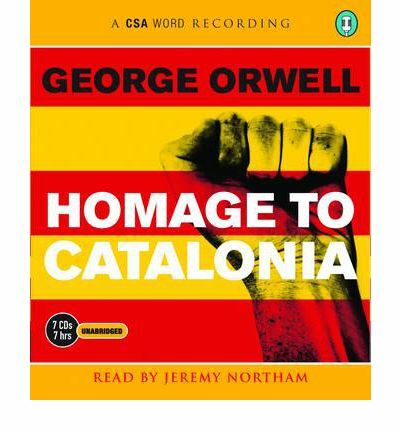 ISBN: 9781906147839 / Cat No: TT7CD903 Homage to Catalonia is George Orwell's vivid account of his experiences fighting in the Spanish Civil War, and a portrait of disillusionment which offers background to the anti-Stalinist subtexts to his later novels, Animal Farm and Nineteen Eighty-Four. Orwell's experiences include being shot in the neck by a sniper, and being forced into hiding as factions of the Left battle on the streets of Barcelona. Orwell entered Spain intending to gather an experience worth writing as well as to fight Fascism, and wrote Homage to Catalonia within months of his return. His fresh memories, honesty and bitterness make for a fulfilling and rounded account of a man's journey from naive enthusiasm to a reluctant loss of ideals. The book was praised for being one of few works of literature to come out of the Spanish Civil War which didn't toe the Communist line; instead, Orwell expresses his anger and unsentimentality about the Left, having seen the political chaos of Republican Spain with his own eyes.